-Flash and audio provide animated, interactive Lesson Introductions, Activities, and Simulations. -Audio accompanies each lesson page throughout the course. -Show Me Hows allow learners to access instructional demonstrations from all courses in the series. -Simulations teach learners to perform specific tasks in applications through guided, multi-step exercises. -Activities allow learners to apply course concepts in an interactive questioning environment. 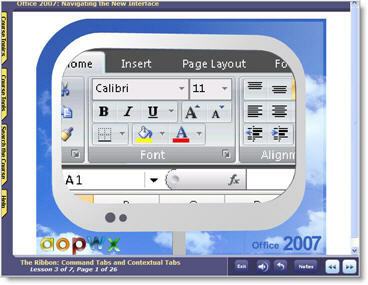 -Full-page images allow learners to experience an application as if it were open on their computer. -Exercises allow learners to practice in the actual application being studied. -A Course Topics list contains active hyperlinks, permitting quick access to specific topics. -Find-A-Word allows learners to look up an unfamiliar term in the Glossary, on the Web, or in a dictionary. In addition, it lets them find other occurrences of the term in the same course. -Search text enables learners to rapidly search all text within a course to easily retrieve information required. -Courses challenge the learner with a variety of question formats, including multi-step simulations, true/false, multiple choice, and fill-in-the-blank. -A skill assessment generates a customized learning path based on the results of a pre-test. -A glossary provides a reference for definitions of unfamiliar terms. -Bookmarking tracks a learner's progress in a course. 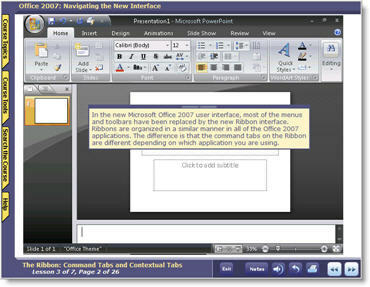 Upon purchasing this Micosoft Office 2007 package, you will IMMEDIATELY receive access to this powerful online training program.